The Tarot is a symbolic map of consciousness that encompasses our journey through life, both spiritually and practically. Tarot reading is the practice of divining wisdom and guidance through a specific spread (or layout) of Tarot cards. However, contrary to popular belief, the cards do not simply tell your fortune, and one does not have to be a psychic to give Tarot readings. 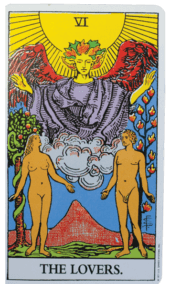 The cards are meant to provide insight into the innermost truths of your higher self. In other words, the cards provide an evolved awareness of what you already know deep within. The origin of the Tarot is unknown, but we do have documented references of Tarot card use back to fourteenth century Europe. The Tarot has been used as an oracle, in the basic form we know today, since the beginning of the seventeenth century. 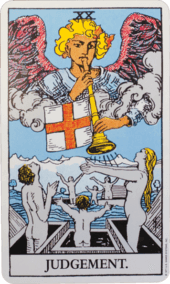 There are 22 cards of the Major Arcana, which divulge greater secrets, and 56 cards of the Minor Arcana, which divulge lesser secrets and are further divided into four suits. The suits of the Minor Arcana include Wands, Swords, Cups, and Pentacles. The fourteen cards in each suit are numbered Ace through Ten, plus the Court Cards: Page (Princess), Knight (Prince), Queen, and King. Decks can vary some in naming. The suits and the individual cards are not always called the same thing, but their core meanings are fairly universal. For example, in some decks, the Knight equates to the King and not the Prince. Most decks come with a booklet you can use to get familiar with its specifics. 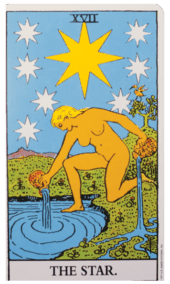 The Minor Arcana of the Tarot symbolize daily aspects of life, giving insight into our challenges, talents, opportunities, and experience of ups and downs. Each suit represents an element: Wands are Fire, Swords are Air, Cups are Water, and Pentacles are Earth. 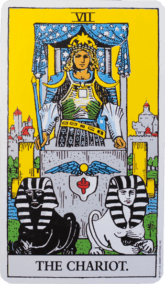 The suits can reflect attitude and temperament, such as a fiery person or someone who is “up in the air” or “down to earth.” Determining a card’s significance is dependent upon the question, the reader, the person receiving the reading, and the placement of other cards in the spread. 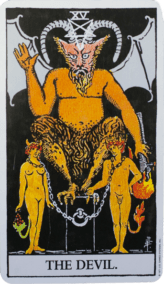 The Major Arcana are numbered 0 through 21, starting with The Fool, and ending with The World. These cards align with the milestones of life’s story or The Hero’s Journey which can be explored further with Joseph Campbell’s book “The Hero With a Thousand Faces.” In this sense, the cards of the Major Arcana represent the 22 inevitable phases or passages of every journey, which we’ll all encounter during our lives (not necessarily in this order). It’s also possible for these phases to repeat themselves, and recur multiple times throughout one’s life, creating a cyclical nature in which there is no true beginning or end. Which is the Best Tarot Deck? There is no “best” Tarot deck. The Rider-Waite is one of the oldest and most widely used decks, with original artwork dating back to the early 1900s. However, hundreds of decks with various themes have been created since then. You can find everything from fiction-based decks like Lord of the Rings, Alice in Wonderland, and My Little Pony, to other themes like Kamasutra, Steampunk, Hollywood, and even Gummy Bears (there’s really something for everyone). 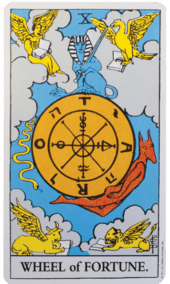 More universally relevant decks include The Crowley Thoth Tarot, The Golden Tarot, The Hermetic Tarot, The Wildwood Tarot, and many more. In choosing a deck, let your intuition guide you to whatever theme and imagery resonate with your soul and journey. There are many types of Tarot spreads. Perhaps the most classic is an eleven-card layout called The Celtic Cross (11 cards including the Significator). There is also a Tree of Life spread, a Planetary spread, the Tetraktys spread, and the Pentagram spread, among many, many others. Some readers like to do simpler, smaller spreads using only three cards. A three-card spread can have many interpretations in and of itself, such as Past-Present-Future, Mind-Body-Spirit, or Situation-Action-Outcome. The variation of three-card spreads is virtually endless. 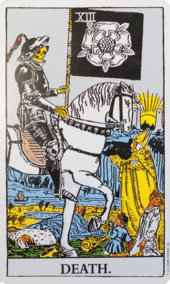 Tarot card illustrations are generally a single image in an upright position, unlike common playing cards that display a dual image facing both right-side-up and upside-down. When Tarot cards are collected and shuffled or moved about, they can show up upside-down in a reading. The reversed Tarot card can be interpreted in various ways. 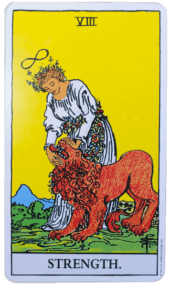 Many believe this simply means the significance of the card is present in your life, but its powers are weakened or blocked by something. 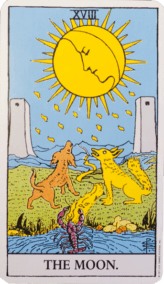 Others believe it means you’re unwilling to work with the energy the card signifies. And yet others interpret a reversed Tarot card to mean that the opposite or inverse of that card’s significance is present. Some deck booklets (such as the classic Rider-Waite) provide you with an official “reversed” meaning along with the main divinatory significance of each card. When learning the Tarot, it’s advisable to stick with right-side-up interpretation, simply turning the card around if it falls upside-down, at least in the beginning. Many people omit the potential confusion of reversed cards by turning them all right-side-up and exploring the full spectrum of energy at play, including both shadow and light expressions. 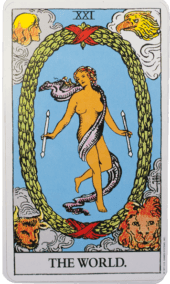 When The Fool is pulled in a reading, it signifies a time of new beginnings that requires courage and a willingness to take a leap into an entirely new cycle or phase or life. 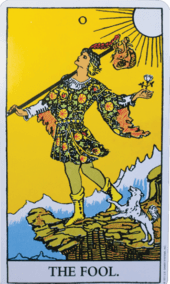 The Fool embodies a desire for adventure, filled with wonder and youthful innocence. The Magician is the master of communication and timing. When you pull The Magician, it reflects a time to make things happen by using the power of your mind, words, voice, and ability to share your ideas. It’s time to make your own magic. Pull the High Priestess and accept the invitation to your deepest self. The High Priestess is intuition, self-trust, and the domain of the subconscious lunar landscape. She reminds you to trust your intuition and tune into your inner wisdom and resources. 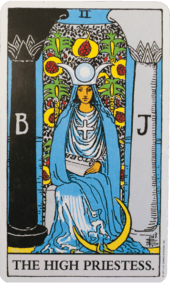 When the Empress appears, you’ve invoked the Earth Mother, who’s a symbol of the ability to give and receive love and nurturing in a healthy balance. 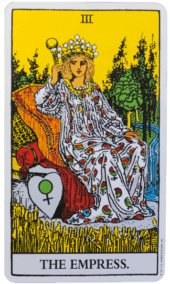 The Empress is comfortable in her body, enjoys sensual pleasures, and uses her creativity to birth the world. When you pull the Emperor, you’re in the realm of personal power and leadership ability. He reflects your capacity to take charge with courage and initiate projects. 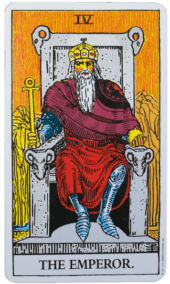 The Emperor often shows up when it’s time to be your own boss in some way or move into the driver’s seat. 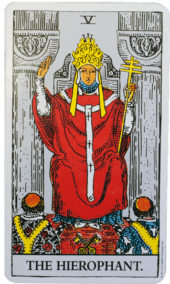 The Hierophant is the spiritual learning and teaching card and can bring us face-to-face with the beliefs, religion, and traditions we’ve adopted. He can signify a time of spiritual growth or initiation, and a mentor or teacher might step into your life. The Lovers card is the art of relationship, within us and without. It’s the union of opposites, bringing two things together, and can reflect the need to make a choice or decision between two situations or two people. The Lovers asks you to look at how you approach, choose, and surrender to love. When the Chariot appears, change and movement are underway. This is a time for victorious progress, moving forward in ways that align with who you are and how you want to be in the world. The Chariot represents the home that moves, which can be physical relocation. We’re all learning to balance our primal animalistic nature with our social civilized selves, and Strength is this phase of our evolution. When you pull Strength, you’re called to express your passion, instincts, and creativity. Renewed vitality and excitement for life await you. 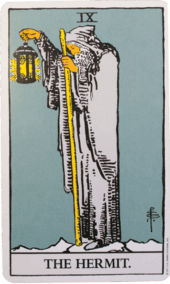 Holding the Star of Hope in his lantern, The Hermit represents your inner wisdom and the ability to light your own path. You may be entering a time of solitude and reflection which will reveal the next steps in perfect time. Explore your inner worlds by taking time away from external distraction. The Wheel turns in fortunate directions for those who believe and allow the movement to take them toward new opportunity. When you pull The Wheel, be open to breakthrough and prosperity. Be willing to enter the unknown, the place where “luck” in the form of something new is possible. When Justice shows itself, you’re in a phase of balance and realignment. It’s time to weigh-in with yourself and release some of the baggage you’ve accumulated that keeps you off-center. 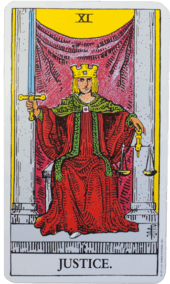 Justice wants harmony in all areas of life – relationships, health, finances, and work. 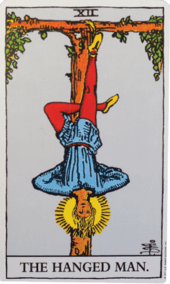 In a reading, The Hanged Man shows the need to see things from a new perspective, hence hanging upside-down. When you pull this card, you’re ready to surrender something and break old patterns. It’s time to see through your illusions. Death is the card of rebirth that comes when you let go of what is already dead. 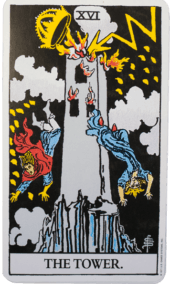 This is not typically the card of physical death, it’s an invitation to detach from the dead weight you’re lugging around and transform into a new phase of life. In this way, you powerfully regenerate yourself. 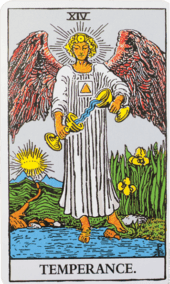 When you pull Temperance, you’re going through, or about to go through a period of integration – things are coming together. At times, it may feel like very little is happening on the outside, but on the inside, you’re alchemizing and creating something new that will soon express itself. The Devil seems to make fun of us and this card is indeed a reminder not to take life so seriously. We’re the ones who tie ourselves up with expectations, judgments, and fear. While The Devil can be a warning to take responsibility for our earthly desires and impulses, it’s equally a reminder to laugh at how we “bedevil” ourselves. Time to take down what isn’t working, clear the rubble, and build something new. The Tower is a wake-up call. You have the power to undo anything that isn’t in alignment with your true desire, nature, and purpose. It’s time to renovate your life. When you pull The Star, feel the renewal of life that a fresh outlook and hope bring. You’re being reminded of your value in society and how you shine brightly in your own unique ways. Take advantage of this time of healing, especially your self-esteem. You may receive public recognition. The Moon calls you to embrace the mystery and all that you can’t reason out or define. Sometimes, when The Moon appears in a reading you will not have clarity right away. It may not be time to know the answer. You may be called into the depths of your soul where images and feelings arise for interpretation. When you pull The Sun, the principle of co-creation, get ready to shine in ways that inspire and motivate others. Just as the Sun in our solar system provides warmth and light, you too are a sun for others on the planet. Let go of things that leave you feeling drained. Follow your heart and team up with others who make you feel excited to be alive. Judgement in a reading highlights the importance of employing good judgment, with a broad perspective, fairness, and objectivity. It may be time to look at your relationship with judgment itself. All of this serves as a path to rebirth or awakening, so you can emerge transformed. You may be ready to follow a new calling. Your hard work has paid off! When The World appears for you, you’ve reached the end of a cycle, which inherently means you’re also starting a new one. And this new cycle is the understanding and experience that it’s all one. 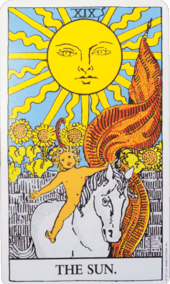 All cards of the Tarot culminate in The World. It’s the totality of everything; wholeness. You’re unlimited in your ability to share your gifts with the world, travel, and fully participate in the cosmic dance. 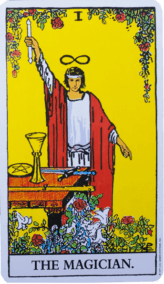 Want to learn more about Tarot reading and the significance of the cards? Find my series of Tarot classes HERE.